After two years as an Independent, Crist endorsed Obama for re-election in 2012, and by year’s end announced that he had officially become a registered Democrat. 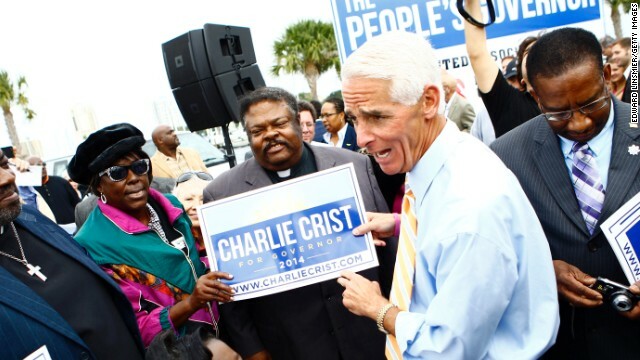 Today, the race between Crist and current governor Rick Scott has become one of the most high-profile in the country. Given his political provenance, Crist has predictably come under scrutiny for “flip flopping” as he has assumed different positions on a myriad of issues - from the Cuban embargo to gay marriage to abortion to healthcare - as a candidate who has traversed the political spectrum from right to left. For the past few months however he has been leading Scott in the polls. Obamacare, now supported by Crist and opposed by Scott, has been a particularly hot topic. Crist leads Scott in the polls, but Scott still fares better than Obama, who paid a visit to the Sunshine State on Friday, March 7. The President was greeted by now-fellow Democrat Crist, although the famously outgoing Crist was conspicuously a little more tempered before the cameras this time. There was no repeat of “the Hug”, which Crist will today describe as “The hug that killed me [as well as] the hug that saved me.” Whether Floridans will actually prove the latter true on voting day remains to be seen.